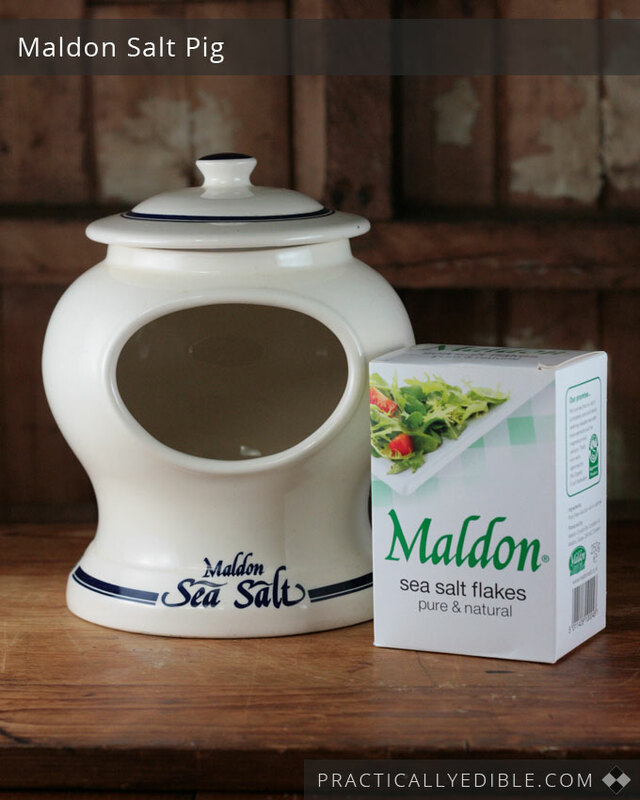 Maldon Salt has been my go-to salt of choice since I discovered it in England in the late 1990s. It’s got a pure clean salt taste, but best of all, the salt is in flakes which provide a wonderful crunch on top of your food. The salt is extracted from the mud flats along the shores of Maldon, Essex, England. Poor Maldon is sometimes called “Maldon in the mud” because of its muddy coast line, but owing to the salt that comes out of it, they’ve been crying about it all the way to the bank since Roman times. 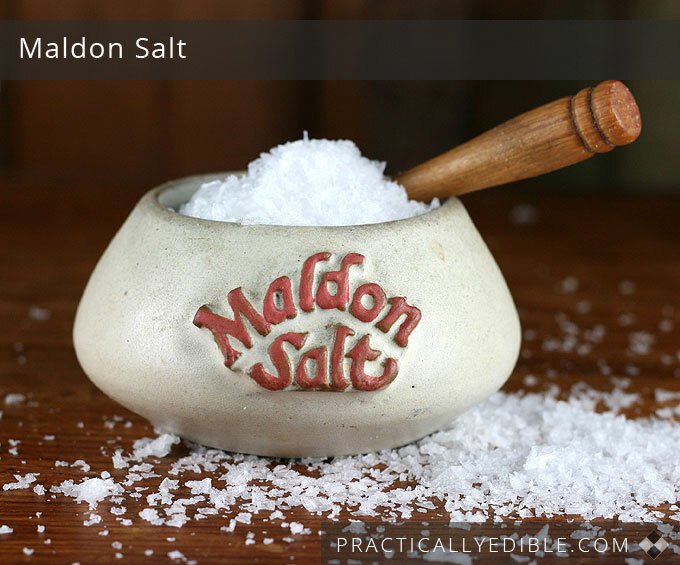 You’d never use Maldon Salt in cooking; it’s what is called a “finishing salt” for use at the table, because the texture is part of what this salt is all about. That being said, the English cook Nigella Lawson scandalized people once by saying she tossed it in her pasta water. It is definitely a salt to be served in salt cellars or small salt pigs at the table. You can provide a spoon, or let people just grab a few pinches with their fingers. The standard wooden salt spoons hold 1/4 teaspoon of salt in volume, which goes a long way on your plate if it’s filled with a crunchy salt like this, so I know you’re seeing right away how you can both increase your salt high and reduce your salt usage at the same time. In fact, this is so good on top of your food, I’d say as a cook definitely cut back on the salt in the food dishes you make so that you can better experience the contrast of the crunch and pure salty taste of Maldon salt on top. Flakes of Maldon are supremely gorgeous on top a steak that has just come freshly screaming off the grill. There’s also a smoked version now, but I have to commit heresy and say even eating it straight up, I really can’t taste any real difference between the smoked and the regular, not as so you’d write home about. One of the family (or the “outlaws”, as we call the in-laws) picked me up this Maldon salt pig for 50 p at a boot sale in Essex. It’s a phenomenal piece of kitchenware, so I’ll always keep it, though it’s so huge I can’t actually imagine filling it with salt. 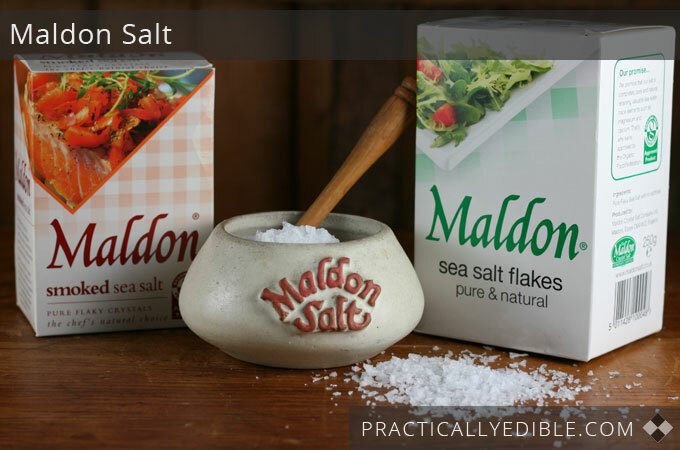 For more in-depth information including the history and making of the salt, see my write-up over on cooksinfo.com on Maldon Salt. Hi Randal; Sounds good but is it iodine free? If so, it could be a problem if one does not get enough iodine from other sources. A lack of iodine apparently isn’t really a concern anymore in first world countries, because everyday table salt is so heavily iodized, and then added so indiscriminately to so many products. (In Canada, iodine application to table salt is close to the highest in the world, at 100 parts per million — that’s why Canadian table salt can have an acrid taste.) Here’s some further information about iodized salt in various countries http://www.cooksinfo.com/salt#iodine . In general I tend to think that today people get so much hidden iodized salt in so many products / eating out / fast food etc. that we’re good — though we probably should get all salt consumption levels back down to 1924 levels. Seafood and sea vegetables such as kelp etc, and dairy are also good sources of iodine. Sea salt, though, is not. What do you feel, Dave?